In 1975 Paul Simon released the song "Have A Good Time" on the Still Crazy After All These Years album. For the last six months or so I find myself singing this tune in my head surprisingly often -- definitely more than any other song. Not sure what that means, but upon closer examination I particularly like the theme presented in the song that my happiness is my own responsibly, and not to believe everything you read in the paper ("they are just out to capture my dime"). I don't always think about that last verse, but is is quite good too. I wonder what Paul Simon thinks about those words now, as we are all having a good time and thinking that we are entitled to our standard of living here in the USA. And God bless the U. S. of A. Here is a link to Paul Simon's web site. Dave Winer: A cantankerous techie who has returned to New York for yet another chapter of his career. If you are not already a follower, there is a pretty good page about him on Wikipedia here. His blog Scripting, and his podcast Rebooting the News with Jay Rosen are two that I follow, but he has done/is doing so much (see the links on his Scripting blog). I have never met him, but would thoroughly enjoy a beer and a lively discussion about tech -- particularly on his self removal from the middle of the circle in Silicon Valley to foster the growth of a new circle in NYC. Steve Jobs: I am hardly the first guy to say that Steve Jobs is a hero. His work over the past 14 years at Apple says alot of it. Not that market cap is a true indicator of value, but here is a chart of the stock VS the NASDAQ since his return in 1997. I imagine a moment when Steve is looking at prototypes of the iPod Touch, to this day I think it is the most amazing of his amazing machines, sometime in 2006 deciding on the size, what to have in or out, the fine points of the form factor... Mine lasted for three years, the third of which I was often heard marveling about how I used it every day and the magic was still there. The guy has a passion for what he does. Unbelievable. Upon meeting him I would ask: have you ever hung out with Keith Richards? Later: Links added and if you want to hear one of the best podcasts ever, listen to yesterday's Rebooting the news with Dave Winer, Jay Rosen, and Doc Searls (guest). There are some podcasts that I skim through at 2X, this one I am going to listen to twice. 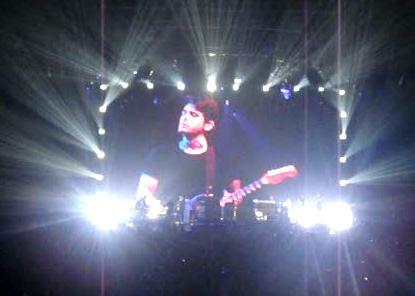 The family and I went to the John Mayer concert in Seattle last night and it was a very good show. A great reminder that we should all do something we love to do. The band took a break, he did not. The music was awesome and he thanked us for being there. I had a great experience and recommend it to anyone who finds themselves in a town where he is playing.